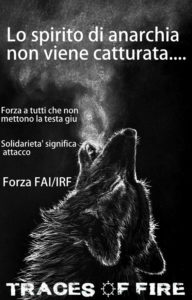 In response to the subject of the event taking place during the International Week of Solidarity with Anarchist Prisoners and on the case of Nicola Sacco and Bartholemeo Vanzetti we would like to throw in our personal and historical contribution. 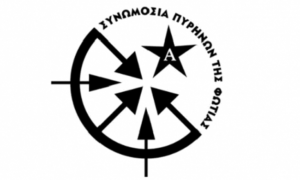 The Conspiracy of Cells of Fire was from the very beginning an anarchist group of direct action that aspired to an upsurge of the anarchist aggressive presence in Greece. Thus, the CCF did not hesitate to often criticize that which was believed to be preventing the generalization of this intensification. But when the oppression finally made it to our doorstep, we fully understood that we would not own up to our standards should we refuse to defend our identity, our political viewpoints and our very substance. Furthermore we could have ended up being in complete contrast with our critiques against others in the past. So seven years after the day that repression struck us, we remain at the forefront of anarchist dignity, at least so as we perceive it. We refused to dishonor ourselves in any way and defended what we believed we had to defend, still paying the price of our uncompromising attitude. Going back to the past in a time when two comrades, anarchists of praxis forged in the fire of revolt, Nicola Sacco and Bartholomeo Vanzetti were arrested with the charges of armed expropriation and murder, we face challenges not in the least unprecedented. A fact which accrues by ample evidence is that both Sacco and Vanzetti, participated in informal militant networks of anarchist affinity all of which were affiliated to publications such as the anarchist newspaper Cronaca Sovversiva, in whose publishing they helped themselves, and which supported the need of propaganda by praxis. It is also known that these informal militant networks were responsible for a series of attacks that shook the United States from 1914 onwards and that they were being funded by armed expropriations. Finally, it is a fact that some of the comrades of Sacco and Vanzetti have confided, after the murder of the two comrades, that they were two of the five robbers of the shoe factory in Braintree, Massachusetts. One of Sacco and Vanzetti’s comrades Mario Buda, for example, in an interview, when asked about the financing of his team he responded, “We would usually go and take them (the money) from where they could be found”, meaning the banks and factories. Many years later, in 1955, he received a visit from the anarchist Charles Poggi who was investigating historically the case of Sacco and Vanzetti. In the discussion between them, Buda admitted at least to the participation of Sacco in the robbery in Braintree with the phrase “Sacco was there” (“Sacco c’ era”). Poggi had the impression that Buda was one of the robbers as well, but due to his discretion he didn’t raise the issue. The two comrades were arrested after a chase and although armed, without the technique of ballistic investigation, which hadn’t been perfected at that time, there was no incriminating evidence against them since all the witnesses could not testify to anything reliable. Thus both comrades chose to defend themselves declaring they were innocent of the robbery, yet guilty as anarchists, at a time, when as little as this is, could be enough proof for someone to be prosecuted, tortured, imprisoned or even deported, as the wave of anarchist attacks that rocked the US had caused the state to take emergency measures against anarchists and anarchist immigrants with a series of laws. At the highlight of the anti-anarchist hysteria which was baptized Red Scare, the two comrades tried to balance on a thin line as to both avoid the death penalty, and maintain their dignity, since they stubbornly refused to forfeit their identity despite the fact that this alone could prove sufficiently condemning. Unfortunately the case of Sacco and Vanzetti is solely remembered today, as a prime example of government fabrication. The historical narrative that has prevailed, is attempting to cast a veil over the broader historical context of the era in which the prosecution of two comrades enveloped, and deliberately mislead portraying them merely as organized unionists, when Sacco and Vanzetti and nearly all the comrades aroundCronaca Sovversiva had deeply anti-formalist feelings, distancing themselves from the official anarchist organizations. Ultimately the case of the two comrades, has been degraded into a story that elevates the value of victimization, instead of being a timeless example of proud anarchist insurrection. Such a theme is hardly unknown even to this day. 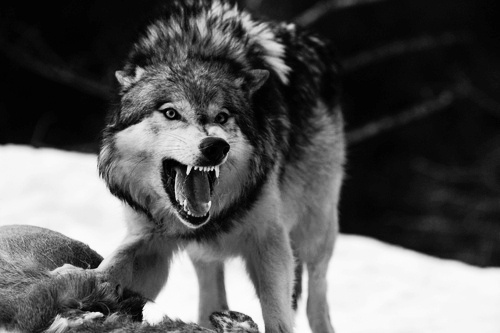 Naturally every comrade always retains the right not to give away even an ounce of himself to the enemy, especially when they have insufficient evidence -if any- to convict him or her. Yet that is one thing, whilst the political fetishism of victimization, that deliberately and utterly forgets those who choose to personally defend their militant commitment to anarchy, is another. And if one is in doubt, let them wonder as to why the names of Sacco and Vanzetti’s comrades are to be cast into oblivion. For how many still remember or know even, about the ‘dynamite-girl’, the 19-year old comrade Gabriella Antollini, who claimed responsibility for transporting weapons and explosives? How many remember Nicola Recci who lost almost all of his hand while manufacturing explosive devices? How often is Carlo Valdinoci mentioned, who died by a bomb explosion that he was planning to plant in the house of the Minister of Justice Palmer; or Andrea Salsedo, who was thrown out of a window by cops during an interrogation about a claim of responsibility that was discovered in his print shop? All of these and many more, were destined to be left out of the history books, because as it happens, they were not “innocent”. At this point, we have to stress that Sacco and Vanzetti, despite declaring themselves innocent of all accusations, never did they denounce their insurrectionary heritage. A fact proved by the number of offensive actions throughout the world made as an indication of solidarity to both comrades. From the bombing, using a wired car, of Wall Street to the parcel bomb sent to the US ambassador in Paris, as well as dozens of bombings of American embassies in a number of countries. The comrades would often themselves urge the movement to retaliations against the state and judges. In June 1926 in an issue of Protesta Umana Vanzetti wrote among other things: “I will try to see Thayer dead before his announcement of our sentence” and asked fellow comrades for “revenge, revenge in our name and in the names of our living and our dead.” The article concluded with “Health Is In You” which was the title of a manual about explosive devices published by Cronaca Sovversiva (some say translated by Emma Goldman herself). Even to this day, the rich contribution of insurrectionary anarchy in the solidarity movement with Sacco and Vanzetti, is largely neglected. 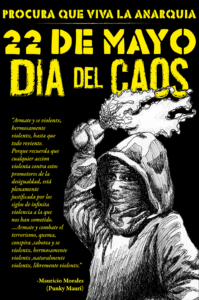 On an occasion such as the call for the International Week of Action for Imprisoned Anarchists the legacy of such militant solidarity is definitely worth remembering in its whole perspective. Anyone who believes the dissociation with militant acts of solidarity is new or lacks roots, is deeply mistaken. A noteworthy fact is that, all the while certain anarchist circles in Argentina slanderedSeverino Di Giovanni, accusing him even of being a fascist, Sacco’s widow in a correspondence a few days after the execution of both comrades expressed her gratitude for his support to their case. In the same letter she indicated that the director of a certain firm of cigarettes named “Combinador” had offered to give to a particular kind of cigarettes the brand “Sacco and Vanzetti”, shamelessly trying to make profit from the notoriety of their case. On November 26, 1927 a bomb planted by Di Giovanni and his comrades blew up a branch of said company in Buenos Aires. Part of the very same group was the comrade of Sacco and Vanzetti, Ferrecio Coacci, who had since been deported from the US. Coacci was also a suspect in the robbery for which Sacco and Vanzetti were convicted and his house was the very first to be raided in regards with the case investigation. We hope these few words to incite interest to those attending the event, and set the grounds for an authentic and comradely discussion on all aforementioned issues since unfortunately, we are doomed to learn nothing of our history, thus condemning ourselves to the same mistakes time and again . From the heart, we send to all of you, our warmest greetings. Αφήνουμε την σκέψη μας να δραπετεύσει και να ταξιδέψει μέχρι τη κεντρική Βραζιλία και στέλνουμε αυτές τις λίγες λέξεις με την ελπίδα, πως έστω και για λίγο, θα μπορέσετε να αισθανθείτε την παρουσία μας δίπλα σας. Με αφορμή το θέμα της εκδήλωσης που γίνεται στα πλαίσια της Διεθνούς Εβδομάδας Αλληλεγγύης στους αναρχικούς αιχμαλώτους και που αφορά την υπόθεση των Nicola Sacco και Vartholomeo Vanzetti θα θέλαμε και εμείς να καταθέσουμε τη δική μας προσωπική και ιστορική συνεισφορά. Η Συνωμοσία Πυρήνων της Φωτιάς ήταν από τη πρώτη στιγμή μια ομάδα άμεσης δράσης που φιλοδοξούσε σε μια γενικότερη όξυνση της αναρχικής επιθετικής παρουσίας στην Ελλάδα. Για αυτό τον λόγο, πέρα από το όποιο επίπεδο της δικής της δράσης, δε δίσταζε να ασκήσει συχνά κριτική στις θέσεις εκείνες που πίστευε πως αποτελούσαν τροχοπέδη στη γενίκευση αυτής της όξυνσης. Όταν τελικά έφτασε το πλήρωμα του χρόνου και η καταστολή χτύπησε τη δική μας πόρτα, είχαμε πλήρη αντίληψη ότι η σταση μας θα ήταν κατώτερη των περιστάσεων, δικαιώνοντας ίσως και κάποιες κακές γλώσσες, εαν δεν υπερασπιζομασταν την ταυτότητα, τη δράση και την υπόσταση μας, κι ότι μάλιστα μια τετοια σταση θα ηταν εντελώς αναντίστοιχη απέναντι στις δικές μας προγενέστερες κριτικές. Έτσι λοιπόν, επτά χρόνια μετά τη μέρα που μας χτύπησε η καταστολή, παραμένουμε στις επάλξεις της αναρχικής αξιοπρέπειας, έτσι όπως εμείς την αντιλαμβανόμαστε. Ακριβώς το γεγονός ότι αρνηθήκαμε με τον έναν ή με τον άλλον τρόπο τον αυτοεξευτελισμό μας και υπερασπιστήκαμε δίχως να υποχωρησουμε τις πολιτικες μας θέσεις, το πληρώνουμε μεχρι και σήμερα. Πηγαίνοντας πίσω στο χρόνο λοιπόν, σε εκείνη την εποχή όπου άλλοι δύο αναρχικοί της πράξης, δύο σύντροφοι σφυρηλατημένοι στη φλόγα της αναρχικής εξέγερσης, οι Nicola Sacco και Vartholomeo Vanzetti, συνελήφθησαν με την κατηγορία της ένοπλης απαλλοτρίωσης μετά φόνου, βρισκόμαστε αντιμέτωποι με προκλήσεις που δεν είναι καθόλου άγνωστες σε ολόκληρη την ιστορία του αναρχικού κινήματος. Είναι γεγονός πλέον που προκύπτει από πληθώρα στοιχείων πως οι δύο σύντροφοι,συμμετείχαν σε άτυπα μαχητικά δίκτυα αναρχικής συγγένειας που όλα τους περιστρέφονταν γύρω από πολιτικά έντυπα, όπως η αναρχική εφημερίδα Cronaca Sovversiva. στην έκδοση της οποίας βοηθούσαν και οι ίδιοι, και η οποία ανοιχτά προωθούσε την αναγκαιότητα της προπαγάνδας μέσω της πράξης. Είναι, επίσης, γνωστό πως αυτά τα άτυπα μαχητικά δίκτυα ήταν υπεύθυνα για μια σειρά επιθέσεων που συγκλόνησαν τις ΗΠΑ από το 1914 και μετά, και πως χρηματοδοτούνταν από ένοπλες απαλλοτριώσεις. Είναι τέλος γεγονός ότι οι ίδιοι οι σύντροφοι των Sacco και Vanzetti είχαν εκμηστερευθεί, μετά την εκτέλεση των δυο συντρόφων, πως ήταν δύο από τους πέντε ληστές του εργοστασίου παπουτσιών στο Braintree της Μαουχουσέτης. Ένας από τους συντρόφους των Sacco και Vanzetti για παράδειγμα, ο Mario Buda, σε συνέντευξη που του είχαν πάρει σχετικά με τη χρηματοδότηση της ομάδας του είχε απαντήσει: “Συνήθως πηγαίναμε και τα παίρναμε από εκεί που ήταν”, εννοώντας τις τράπεζες και τα εργοστάσια. Ο ίδιος, επίσης, πολλά χρόνια αργότερα, το 1955, είχε δεχθεί επίσκεψη από τον αναρχικό Charles Poggi, ο οποίος ερευνούσε για ιστορικούς λόγους την υπόθεση των Sacco και Vanzetti. Στη μεταξύ τους συζήτηση ο Buda παραδέχτηκε τουλάχιστον τη συμμετοχή του Sacco στη συγκεκριμένη ληστεία στο Braintree με τη φράση “Sacco c’era” (ο Sacco ήταν εκεί). Ο Poggi έμεινε με την εντύπωση πως και ο ίδιος ο Buda ήταν ένας από τους ληστές αλλά από διακριτικότητα δεν έθιξε το θέμα. Οι δύο σύντροφοι είχαν συλληφθεί μετά από καταδίωξη και ενώ οπλοφορούσαν . Χωρίς την τεχνική της βαλιστικής έρευνας, που τότε δεν είχε τελειοποιηθεί, δεν υπήρχε κανένα άλλο επιβαρυντικό στοιχείο εναντίον τους καθώς το σύνολο των μαρτύρων δεν μπορούσε να καταθέσει κάτι αξιόπιστο. Έτσι λοιπόν, οι δύο σύντροφοι επέλεξαν να υπερασπιστούν τους εαυτούς τους δηλώνοντας αθώοι για τη ληστεία αλλά ένοχοι ως αναρχικοί σε μια εποχή που ακόμα και αυτό αρκούσε για να διωχθείς, να βασανιστείς, να φυλακιστείς ή να απελαθείς καθώς το κύμα αναρχικών επιθέσεων που συγκλόνιζε τις ΗΠΑ είχε οδηγήσει το κράτος να λάβει έκτακτα μέτρα εναντίον αναρχικών, ντόπιων ή μεταναστών, με μια σειρά ειδικών νόμων. Στο αποκορύφωμα αυτής της αντι-αναρχικής υστερίας που εύσχημα βαφτίστηκε “Κόκκινος τρόμος”, οι δύο σύντροφοι προσπάθησαν να ισορροπήσουν σε μια λεπτή γραμμή, ώστε να αποφύγουν αφενός την θανατική ποινή και αφετέρου να διατηρήσουν την αξιοπρέπεια τους καθώς ποτέ τους δεν αρνήθηκαν τις πολιτικές τους θέσεις, παρά το γεγονός ότι αυτό από μόνο του αρκούσε για να λειτουργήσει επιβαρυντικά. Δυστυχώς όμως, στην ιστορία τόσα χρόνια μετά, δεν εχει μείνει παρά η αναγωγή της υπόθεσης των δυο συντρόφων σε σύμβολο κρατικής σκευωρίας. Έχει επικρατήσει μια ιστορική αφήγηση που ρίχνει πέπλο στο ευρύτερο πολιτικό πλαίσιο της εποχής στην οποία εξελίχθηκε η δίωξη των δύο συντρόφων αλλά και που σκοπίμως παραπλανά εμφανίζοντας τους ως οργανωμένους συνδικαλιστές, τη στιγμή που οι Sacco και Vanzetti όπως και το σύνολο σχεδόν των συντρόφων τους γύρω από την Cronaca Sovversiva απεχθάνονταν τις επίσημες φορμαλιστικές αναρχικές οργανώσεις ερχόμενοι συχνά σε αντιπαράθεση μαζί τους. Αντί λοιπόν η υπόθεση των δυο συντρόφων να αποτελεί ένα διαχρονικό έρεισμα για τη διαρκή αναρχική εξέγερση, έχει καταλήξει μια ιστορία που εξυψώνει την αξία της θυματοποίησης. Η νοοτροπία αυτή δεν μας είναι καθόλου άγνωστη καθώς τη συναντάμε και στις μέρες μας. Φυσικά κάθε σύντροφος έχει πάντοτε το δικαίωμα να μην παραχωρεί ούτε χιλιοστό από τον εαυτό του στον εχθρό, ειδικά όταν δεν μπορούν να προκύψουν στοιχεία ικανά να τον καταδικάσουν. Όμως μία τέτοια θέση απέχει πολύ από τον πολιτικό φετιχισμό της θυματοποίησης που ξεχνά εντέχνως όσους επιλέγουν να υπερασπιστούν αυτοπροσώπως τη μαχητική τους στράτευση στην αναρχία. Κι αν αμφιβάλει κανείς, δεν έχει παρά να αναρωτηθεί γιατί ποτέ δεν γίνεται μνεία για τους υπόλοιπους συντρόφους των Sacco και Vanzetti. Αλήθεια, ποιοί θυμούνται ή ποιοί γνωρίζουν για το κορίτσι-δυναμίτη , τη 19χρονη συντρόφισσα Gabriella Antollini που ανέλαβε την ευθύνη για την μεταφορά όπλων και εκρηκτικών; Πόσοι θυμούνται τον Nicola Recci που έχασε σχεδόν ολόκληρο το χέρι του ενώ κατασκεύαζε εκρηκτικούς μηχανισμούς; Πόσο συχνά μνημονεύεται ο Carlo Valdinoci που σκοτώθηκε από την έκρηξη βόμβας που σχεδίαζε να τοποθετήσει στο σπίτι του υπουργού δικαιοσύνης Palmer ή ο Andrea Salsedo που εκπαραθυρώθηκε από τα γραφεία των μπάτσων στη διάρκεια της ανάκρισης του για μια ανάληψη ευθύνης που βρέθηκε στο τυπογραφείο του; Όλοι αυτοί και πόσοι άλλοι αναγράφονται με ψιλά γράμματα στην ιστορία, γιατί έτυχε να μην είναι αθώοι. Αξίζει να σημειωθεί πάντως, ότι παρά το γεγονός ότι οι σύντροφοι Sacco και Vanzetti διατήρησαν την προαναφερθείσα υπερασπιστική γραμμή ουδέποτε αποκηρυξαν την εξεγερτική κληρονομιά που μοιράζονταν με τους υπόλοιπους συντρόφους τους. Και αυτό πιστοποιείται από το πλήθος επιθετικών ενεργειών σε όλο τον κόσμο που έγιναν ως ένδειξη αλληλεγγύης προς τους δύο συντρόφους. Από την έκρηξη άμαξας-βόμβας στην Wall Street μέχρι την αποστολή δέματος βόμβας στον Αμερικάνο πρέσβη στο Παρίσι, καθώς και τις δεκάδες βόμβες σε Αμερικάνικες πρεσβείες πολλών χωρών. Οι ίδιοι οι σύντροφοι πολύ συχνά προέτρεπαν σε αντίποινα ενάντια στο κράτος και τους δικαστές. Τον Ιούνιο του 1926 σε ένα τεύχος της Protesta Umana ο Vanzetti έγραφε μεταξύ άλλων: “Θα προσπαθήσω να δω τον Thayer νεκρό πριν ανακοινώσει την ποινή μας”, και συνέχιζε με μια προτροπή προς τους συντρόφους του, “εκδίκηση, εκδίκηση στο όνομα μας και στα ονόματα των ζωντανών και των νεκρών μας”. Το κείμενο τελείωνε με το “Η Υγεία Βρίσκεται Μέσα Σου”, που ήταν ο τίτλος ενός εγχειριδίου κατασκευής εκρηκτικών μηχανισμών που είχε δημοσιεύσει η Cronaca Sovversiva.. Για κάποιους μάλιστα το εγχειρίδιο αυτό είχε μεταφραστεί από τα ιταλικά στα αγγλικά από την Emma Goldman. Όμως ακόμα και σήμερα παραγνωρίζεται η πλούσια συνεισφορά της εξεγερτικής αναρχίας στο κίνημα αλληλεγγύης στους Sacco και Vanzetti, το οποίο, ειδικά ενόψει του καλέσματος για τη Διεθνή Εβδομάδα Δράσης αξίζει να θυμόμαστε στην πληρότητα του. Εξάλλου όποιος νομίζει ότι η αποστασιοποίηση από την εκδήλωση της επιθετικής αναρχικής αλληλεγγύης είναι κάτι νέο, είναι βαθιά γελασμένος. Την ίδια εποχή που στην Αργεντινή ορισμένοι αναρχικοί κύκλοι έβαζαν στο στόχαστρο της κριτικής τους τον Severinno Di Giovani κατηγορώντας τον ακόμα κι ως φασίστα, η χήρα του Sacco του έστελνε μια επιστολή λίγες μέρες μετά την εκτέλεση των δυο συντρόφων για να του εκφράσει τις ευχαριστίες της για την στήριξη που τους είχε δείξει. Στην ίδια μάλιστα επιστολή του υποδείκνυε τον διευθυντή της εταιρείας τσιγάρων Combinador που είχε προσφερθεί να δώσει σε μια συγκεκριμένη μάρκα τσιγάρων την επωνυμία “Sacco & Vanzetti”, προσπαθώντας να αποκομίσει κέρδος από τη δημοσιότητα που είχε πάρει η υπόθεση τους. Στις 26 Νοεμβρίου του 1927 ένα υποκατάστημα της συγκεκριμένης εταιρείας ανατινάχτηκε στο Buenos Aires από τον Di Giovani και τους συντρόφους του. Μάλιστα στην ίδια ομάδα φέρεται να συμμετείχε και ο σύντροφος των Sacco και Vanzetti, ο Ferrecio Coacci, από τότε που απελάθηκε από τις ΗΠΑ. Ο Coacci ήταν επίσης ύποπτος για την ληστεία για την οποία τελικά καταδικάστηκαν οι δύο σύντροφοι και μάλιστα το δικό του σπίτι ήταν το πρώτο που ερευνήθηκε για την υπόθεση αυτή. Για το τέλος ας κρατήσουμε μια φράση του αναρχικού Luigi Galleani, συντρόφου των Sacco και Vanzetti, και ιδρυτή της Cronaca Sovversiva : “Καμιά πράξη εξέγερσης δεν είναι άχρηστη, καμία πράξη εξέγερσης δεν είναι βλαβερή”. «Τη δεύτερη μέρα καλέστηκε σύνοδος των συνάναρχων αδελφών. Εκεί εμφανίστηκε μέσα από έναν καιγόμενο κάδο πνεύμα αγγέλου και διαλάλησε στο κοινό: Τα τάγματα του διαβόλου επιτέθηκαν στους οδοιπόρους και τους αρνητές, τους κρατάνε στα δεσμά, γκρεμίζουν τα καταφύγιά τους. Οι συνάναρχοι αδελφοί κοίταξαν στον ουρανό. Ένα μαύρο αστέρι σηκώθηκε ψηλά. Με μια ακτίνα φωτιάς έδειξε το νέο ναό του Σολομώντα. Το άνδρο των Φαρισαίων και των εμπόρων, στα Σόδομα του Κολωνακίου. Στις 8 Αυγούστου χτυπήσαμε την έδρα της ελληνικής Εκκλησίας. Ήταν μια απάντηση στο νέο κύμα κρατικής καταστολής. Στις 27 Ιούλη το κράτος εισέβαλε σε τρεις στεγαστικές καταλήψεις μεταναστών στη Θεσσαλονίκη. Έγιναν 100 προσαγωγές, που κατέληξαν σε 74 συλλήψεις και ποινικές διώξεις. Η κατάληψη του Ορφανοτροφείου για την οποία εμφανίζεται η Μητρόπολη Θεσσαλονίκης ως ιδιοκτήτης και μηνυτής των καταληψιών, κατεδαφίστηκε το ίδιο πρωί. Το κράτος επιτίθεται στις καταλήψεις γιατί αποτελούν εστίες αυτοοργάνωσης των καταπιεσμένων, προσφέρουν τόπο ελεύθερης συμβίωσης ντόπιων και μεταναστών. Είναι ακριβώς αυτοί οι χώροι όπου ζυμώνονται πολιτικές συνειδήσεις και το ατομικό γίνεται συλλογικό, σχηματίζουν μια αλυσίδα αντίστασης και αλληλεγγύης ενάντια στους κρατικούς θεσμούς, είναι απτό παράδειγμα ενός κόσμου χωρίς εξουσία και γίνονται σημεία αντεπίθεσης στην κυριαρχία των αφεντικών. Οι καταλήψεις προμηνύουν την ανακατάληψη όλης της γης από τους καταπιεσμένους. Για όλους αυτούς τους λόγους αντιλαμβανόμαστε τις καταλήψεις ως μέσα του αγώνα για τη συνολική απελευθέρωση από την εξουσία και ταυτόχρονα ως εγχειρήματα που εφαρμόζουν αυτό το πρόταγμα στο τώρα. Για τους ίδιους λόγους οι καταλήψεις βρίσκονται στο στόχαστρο όλων των κρατών. Με πιο πρόσφατες περιπτώσεις, τη Rigaer74 στη Γερμανία και την Αναρχική Βιβλιοθήκη KAOS στη Βραζιλία. Αρκετές καταλήψεις αντιστέκονται στις αστυνομικές επιχειρήσεις μαχητικά και αντιστρέφουν τα χτυπήματα που δέχονται με εξεγερσιακές κινητοποιήσεις. Η εμπρηστική μας δράση είναι μήνυμα και γι’ αυτούς τους συντρόφους. Μήνυμα έμπρακτης επιθετικής αλληλεγγύης. Ο αντικρατικός αγώνας δεν αναγνωρίζει σύνορα. Στα στρατόπεδα συγκέντρωσης μεταναστών συνεχίζουν να πεθαίνουν άνθρωποι επειδή βρίσκονται αποκλεισμένοι. Με την επίθεση στις αυτοοργανωμένες δομές στέγασης το κράτος θέλει να διατηρήσει την απομόνωση και την εξαθλίωση σαν μοναδική προοπτική των μεταναστών. Όσο κρατιέται αδύναμο και αναλώσιμο αυτό το μεγάλο ανθρώπινο σύνολο, τόσο πιο εκμεταλλεύσιμο είναι. Πάνω στην αδυναμία που παρατείνεται με την συνεχιζόμενη βία που ζουν οι μετανάστες, κερδοσκοπούν οι ΜΚΟ, η Εκκλησία και οι εργολάβοι των στρατοπέδων συγκέντρωσης και στήνουν την «ανθρωπιστική» τραγωδία τους οι κρατικοί μηχανισμοί (κυβέρνηση, μίντια, ιατρικοί και δικηγορικοί σύλλογοι, λιμενόμπατσοι, μπάτσοι, στρατός και βέβαια η Εκκλησία). Οι υπαίτιοι της προσφυγιάς, της φτώχειας και του θανάτου παρουσιάζονται σαν αυτόκλητοι σωτήρες. Η Εκκλησία ειδικότερα είναι ο πρωτεργάτης του «ανθρωπισμού»: Εκμεταλλεύεται άμεσα ή έμμεσα το 60% της γης στην ελληνική επικράτεια. Είναι ο μεγαλύτερος επενδυτής real estate και άλλων κερδοσκοπικών μεγαλοεπιχειρήσεων (πχ ιδιωτικές κλινικές, που θησαυρίζουν από την αρρώστια, τον πόνο και την αγωνία των ανθρώπων). Ξεπλένει παράνομο χρήμα και τζογάρει το «νόμιμο». Δηλαδή, βρίσκεται στο επίκεντρο των πιο βρώμικων deals, πχ. το σκάνδαλο Βαβύλη, του κυπατζή που κυκλοφορούσε με ράσα και μπαινόβγαινε στην Αρχιεπισκοπή με μια βαλίτσα ηρωίνη. Ναρκωτικά, παιδεραστία, παντού ρεμούλα. Οι «ιερές» bussiness. Αυτά προσπαθούν να προστατέψουν η αριστερά και η δεξιά του κεφαλαίου και «του Κυρίου» όταν μιλάνε για «σεβασμό στις θρησκευτικές ελευθερίες» και για «βέβηλους συμβολισμούς». Η Εκκλησία ήταν πάντα ισχυρός πολιτικός παράγοντας των κρατών. Όλοι οι κυβερνήτες υποκλίνονται στο παπαδαριό, γιατί είναι ο μεγαλοεπιχειρηματίας που πουλάει μαζικά κοινωνική ειρήνη και συναίνεση. Η Εκκλησία υπερασπίζεται τις εξουσίες και συνεργάζεται με τον πιο ισχυρό. Πριν την ύπαρξη του ελληνικού κράτους, επί οθωμανικής αυτοκρατορίας, η Ορθόδοξη Εκκλησία ήταν ασπίδα του Σουλτάνου, σήμερα ευλογεί την εθνική σημαία. Ο καθεστωτικός χριστιανισμός είναι πυλώνας του κεφαλαιοκρατικού πολιτισμού, σχολείο υποταγής, δουλοπρέπειας και ολοφάνερης απαξίωσης του ανθρώπου και της φύσης. Δεν ξεχνάμε και δεν συγχωρούμε τα εγκλήματα του κράτους και της Εκκλησίας. Το χτύπημα στη Μονή Πετράκη ήταν επίθεση σε ένα διοικητήριο του εχθρού. Οι πολιτικές δράσεις ενάντια στην Εκκλησία δεν στρέφονται ενάντια στους θρησκευόμενους. Τα κράτη και οι Εκκλησίες προκαλούν τον φανατισμό, τους εθνικούς-θρησκευτικούς πολέμους, την προσφυγιά και τον ρατσισμό. Μετά το χτύπημά μας το παπαδαριό και όλα τα κόμματα δεν έχασαν την ευκαιρία να υποδαυλίσουν το θρησκευτικό μίσος ενάντια στους «ασεβείς». Αλλά δεν μπορούσαν να κρύψουν τον φόβο τους απέναντι στην αδυναμία τους να θωρακίσουν τα διοικητικά κέντρα τους και τους χλιδάτους χώρους διαβίωσής τους. Ο πανικός τους φανερώνει πόσο φτηνή προπαγάνδα είναι τα περί «λατρευτικού δικαιώματος». Το μήνυμα της επιλογής να χτυπήσουμε το κέντρο αποφάσεων της Εκκλησίας μέσα στο Κολωνάκι, μια περιοχή υψηλής προστασίας, είναι ξεκάθαρο: Το κράτος μάταια νομίζει, με την αλαζονεία που το χαρακτηρίζει, ότι μπορεί να ισοπεδώσει τις συλλογικές δομές μας. Εμείς μπορούμε να εισβάλουμε στην καρδιά του και να του επιστρέψουμε τα χτυπήματα ακόμη πιο ισχυρά. Γιατί μπορεί να γκρέμισαν ένα κτήριο, αλλά δεν μπορούν να σταματήσουν το κίνημα των καταλήψεων που απαντάει με αυτοδιάθεση για όλες μας τις ανάγκες. Αντίθετα, οι κατασταλτικές απόπειρες πυροδοτούν την οργή που θα τους κάψει. Έτσι, χαιρετίζουμε συντροφικά όλες τις κινήσεις αλληλεγγύης που έγιναν τοπικά και διεθνώς με αφορμή την εκκένωση των τριών καταλήψεων. Η καλοκαιρινή επίθεση στις καταλήψεις, που είχε ξεκινήσει με την απειλή εκκένωσης της Βανκούβερ Απάρτμεντ και την αστυνομική εισβολή σε καινούριους χώρους στέγασης στα Εξάρχεια, είναι προπαρασκευαστική για μια γενικότερη επίθεση στον αυτοοργανωμένο αγώνα το επόμενο διάστημα. Οι διαχειριστές του κράτους επιχειρούν να ξεπεράσουν τη συστημική κρίση με μεγαλύτερη καταπίεση, εξαθλίωση και εκμετάλλευση. Γι’ αυτό επιτίθενται πρώτα στον κόσμο του αγώνα. Γι’ αυτό επιστρατεύουν την περαιτέρω όξυνση των συντηρητικών αντανακλαστικών. Η αριστερά σφιχταγκαλιάζεται ολοένα παραπάνω με τους φασίστες της παραδοσιακής και της ναζιστικής ακροδεξιάς. Σ’ αυτό το πλαίσιο εντάσσονται και οι πυροβολισμοί των μπάτσων εναντίον των δυο αγωνιστών, Κώστα Σακκά και Μάριου Σεϊσίδη, στη Σπάρτη. Οι θεσμικοί παράγοντες που εξέφρασαν τον αποτροπιασμό τους για την επίθεση στην «Ιερά Σύνοδο», κάνανε τις πάπιες για τις πιστολιές σε άοπλους, τους ξυλοδαρμούς στο Α.Τ. και τα βασανιστήρια που έγιναν από τα τσογλάνια της αντιτρομοκρατικής. 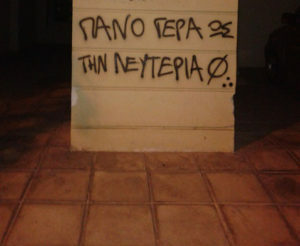 Έχουμε πόλεμο. Τον έχουν κηρύξει από τότε που υπάρχει εξουσία και μας χτυπάνε χωρίς ενδοιασμούς. Σκοπός τους να πεθάνουμε φυλακισμένοι, σκλάβοι. Έχουν ήδη χάσει. Χτυπώντας τον πιο παραδοσιακό πόλο του ελληνικού κράτους (Εκκλησία), δείξαμε ότι εκεί που αναζητούν ασφάλεια τα αριστερά και δεξιά αφεντικά, υπάρχει ένας τάφος στον οποίο θα θαφτεί όλο το σύστημα εξουσίας. 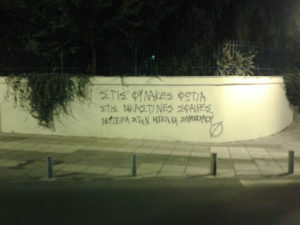 Ο Τόσκας λέει ότι «έχουν γνώση οι φύλακες». Εμείς λέμε ότι δεν ξέρουν τι τους γίνεται. Στοχεύσαμε σε μια κεντρική δομή. Διεισδύσαμε και διαφύγαμε από μια υποτιθέμενα υπερφρουρούμενη περιοχή. Χρησιμοποιήσαμε απλά, αλλά πάντα αποτελεσματικά όπλα: τις εμπρηστικές μολότοφ. Έτσι δείξαμε ότι όποιος θέλει μπορεί να οργανωθεί για να επιτεθεί στην εξουσία. Είμαστε με περηφάνια οι αρνητές του αποτυχημένου κόσμου της εξουσίας. Είμαστε εδώ για να τον καταστρέψουμε. Είμαστε ο ζωντανός κόσμος της ελευθερίας και της αλληλεγγύης.